← John Prine: “The Oldest Baby in the World”. Islanwana was the first battle in the very brief Anglo-Zulu War. It was a stunning Zulu victory and represents the blackest of pages in British military history. A Zulu army attacked and annihilated a heavily armed, encamped, but unprepared British force of 1,800 on 22 e 1879. Although an exact count of Zulu combatants may never be known, their number has been roughly calculated at 20,000. The next day four Zulu regiments, 3,000 to 4,000 men, moved against Rorke’s Drift, six miles away. Zulu recounts the nine hour Battle of Rork’s Drift and is one of my all-time favorite films. Zulu is Michael Caine’s first starring role and his portrayal of Lieutenant Gonville Bromhead, a public school fop whose mannerisms, not to mention his name, make him a target for people who love to hate the British upper class. Caine’s nemesis is Lieutenant John Chard of the Royal Engineers,who appears to be from more common stock. Chard is played by Stanley Baker who also produced the film. Nigel Green portrays Sgt. Bourne, a quintessential career Sergeant Major who is as imperturbable as a British marble lion. His moustache alone seems to soothe the troops and control any situation. It is doubtful anyone at Rorke’s Drift, except the Boar who delivers the news of Islanwana and stays to fight, knew who or what they were up against. They had much to fear, more than they could ever have imagined. The progenitor of their unease was Shaka. Considered to be a military genius, Shaka (b.1787-d.1828) was born in Kwa-zulu Natal. His skill as an administrator, diplomat and politician are still disputed, but he gathered disparate local tribes under his banner and made them into an army that was feared throughout Africa. Shaka developed unique battlefield tactics and a level of discipline among his troops which years after his death, served to propelled the Zulu to stunning victories against the Dutch Boars and the British at Islanwana. Shaka’s legacy resonates today in military schools around the world. 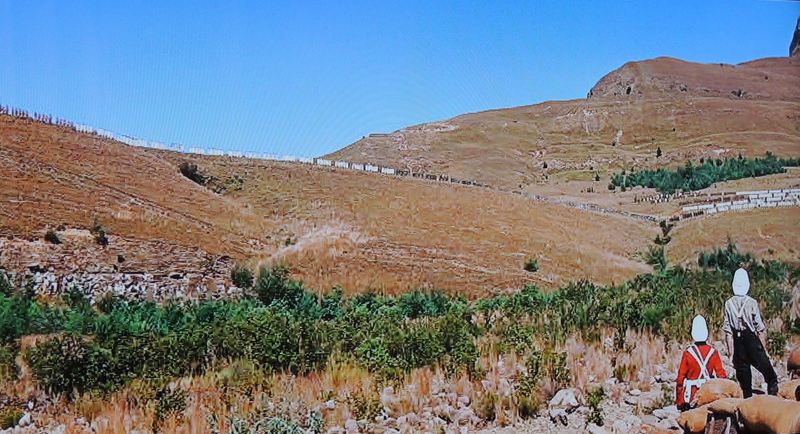 In one of Zulu’s early scenes, Mangosuthu Buthelezi, played by his great grandson Chief Burthelezi, oversees a traditional mass wedding ceremony in his Kraal or fortified village. Here we meet the Swedish Reverend Otto Witt played by Jack Hawkins who has brought his innocent 20 something daughter to East Africa. Witt tells his daughter the Zulu are a great people, but she appears more embarrassed and titillated at the same time, as hundreds of bare breasted brides-to-be, match step for provocative step, the sensually aggressive dance of their warrior grooms. the Zulu assaults upon Rorke’s Drift mission station. Bromhead and Chard, both Lieutenants, must work out which of them is in charge. This leads to my favorite line, spoken by Caine, but I won’t give it away. You can’t miss it. It takes Sgt. Major Bourne some time to adapt to an unfamiliar chain of command. But of course he soldiers on and prior to the first Zulu assault, his slow walk behind the men on the firing line, is a scene of pure dramatic genius. The Boar draws the infamous Zulu “Bull Horns” battle formation in the sand for Chard and Bromhead and patiently explains how this now famous formation accounts for Zulu military victories. 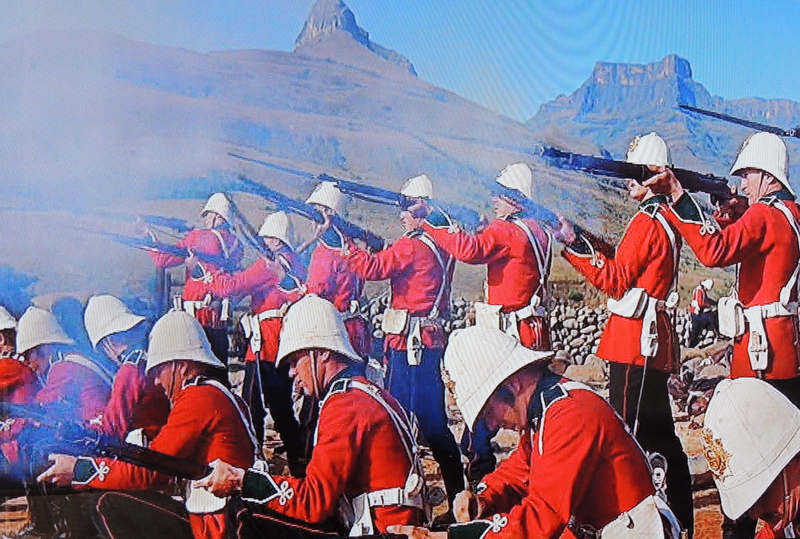 The moment Rorke’s Drift defenders realize something sinister is afoot, the hairs on my neck raised and almost 50 years later that moment still works its magic. There are more subtle moments too, but most of them will be missed by all but avid military buffs. The depictions of British volley tactics are accurate as are the brief moments showing Zulu warrior’s inexperience with Martini Henry breech loading rifles. British officers wore only a side arm, a mark of courage and rank. There is a desperate moment when Caine, an officer, has a rifle thrust into his hand. The look of bemusement on Caine’s face takes only a nano second, but is priceless. Richard Burton provides the opening and closing voice over. Because of apartheid, the Zulu could not be paid for their services. Director Cy Endfield gave them all the cattle used in the film, payment much more highly prized than money. 11 defenders of Rorke’s Drift were awarded theVictoria Cross, the highest number ever bestowed for one engagement. This largesse has been explained by some to be an attempt to expunge the stain of Islanwana.